Camping out has long been one of the most important ingredients to intimacy with God. In the Old Testament it was the nomadic family of Abraham that exemplified the importance of meeting God in isolated camping situations. Jacob camped at Bethel and met the Lord in a powerful way. You too can meet God in special times of fellowship and communion in which God will speak to your heart. I encourage you to get a tent and some camping equipment and spend at least a couple of nights alone in a wildress camping experience with the Lord. God delights when his people make room for him and seek him in private. If you are not a wilderness camper or you prefer a tent camper, trailer, or RV to a tent then use what you have but make it a solitary trek with the Lord into the wilderness to hear from God. God speaks, in fact he is always speaking. The problem is not God not speaking, but us not getting quiet enough to listen. Use the 6 Steps of Prayer we have been teaching here for the last 25 years. You can download a copy of the manual, the workbook, and other helps on our main page. 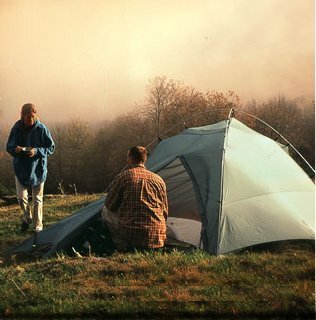 Or you can simplify for a hike or simpler camping experience by downloading our six steps in a booklet form. We call it A CAMPER'S PRAYER GUIDE. It is in PDF format. It is designed to be printed on both sides of the paper like a booklet then folded like a bulletin.